When I was in Reykjavik, Iceland last year I went to a store down the street from my hotel to pick up a few sweet treats to bring home to my husband. 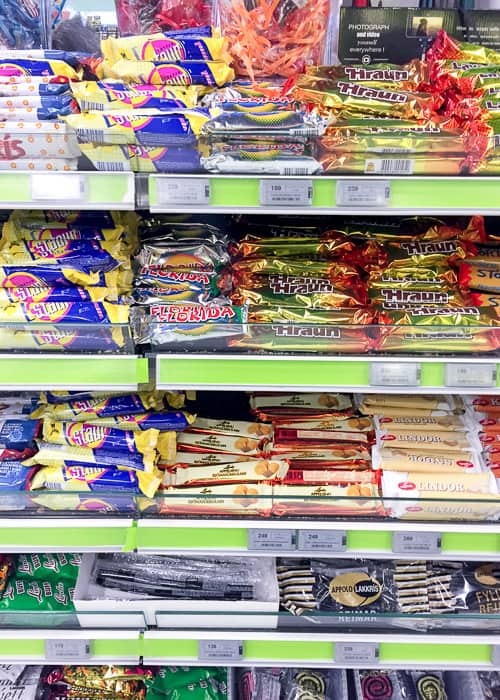 I imagined finding one or two unfamiliar candy or chocolate bars, so imagine my surprise when I found an entire aisle devoted to Icelandic candy, chocolate bars, and other sweets! Seriously, there were like 50 different sweets to choose from in that tiny Icelandic grocery store. 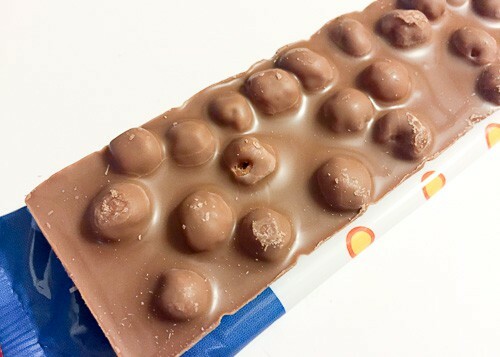 As it turns out, import restrictions used to make foreign chocolate bars and sweets unavailable in Iceland. So they made their own! 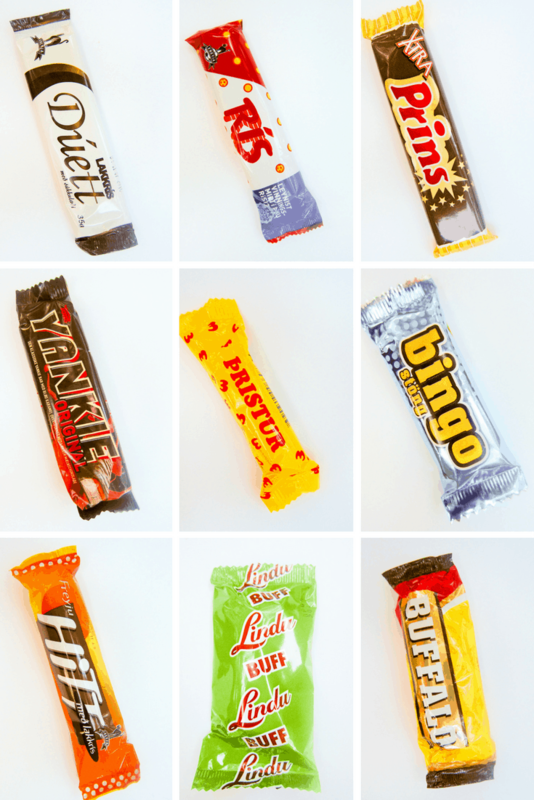 Nowadays, however, you’ll find the typical Snickers, Milky Ways, and various European chocolate bars. You’ll also still find a huge selection of traditional Icelandic chocolate and other goodies. I was a little embarrassed to check out of the grocery store with a shopping basket full of chocolate, one banana, and a bottle of water…but so is the life of a food and travel blogger (haha). Later, I heard that Icelanders love their sweets, so you know, you do what you’ve gotta do to fit into the local culture. 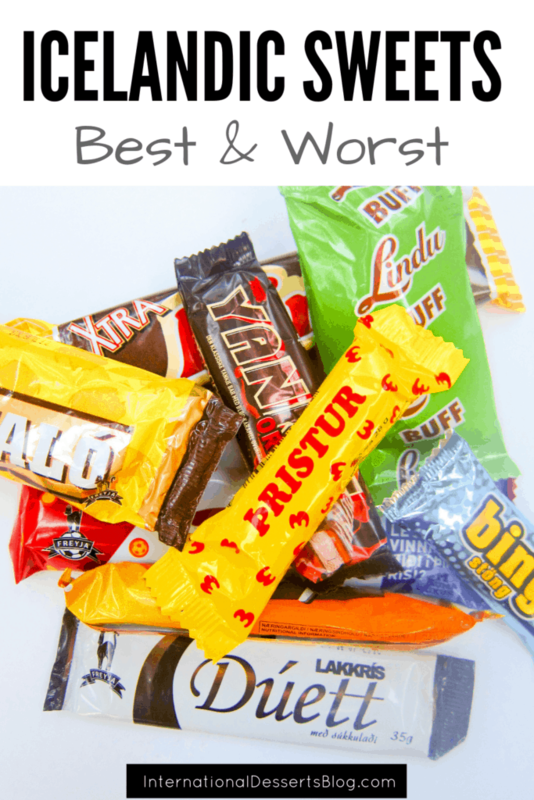 Once back home in the US, my husband, Aaron, and I taste-tested each chocolate bar. Some were quite a surprise! Here’s a run-down of 9 Icelandic chocolate bars that we tried. 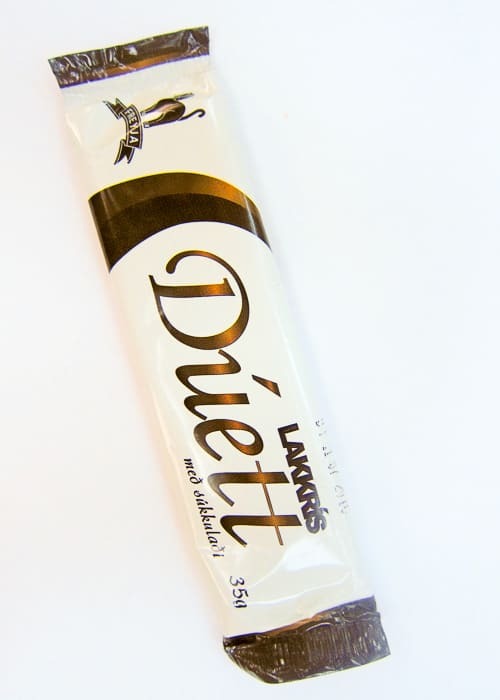 1 My favorite Icelandic chocolate bar? 2 Want to try Icelandic chocolate? 3.1 Move Over Sugar Cookies! 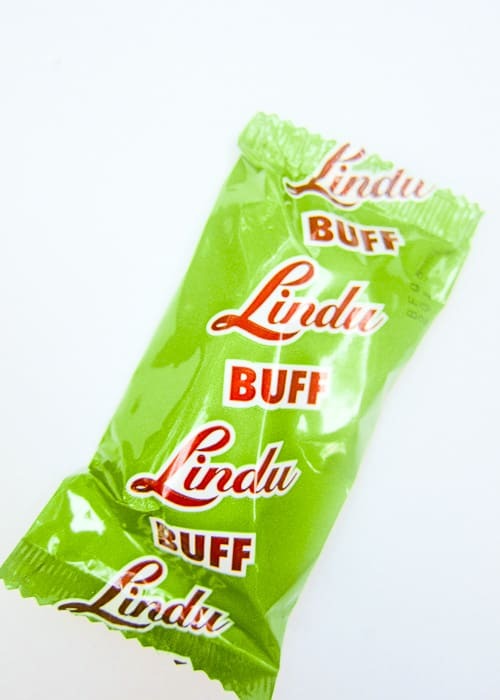 The Lindau Buff is an Icelandic classic. 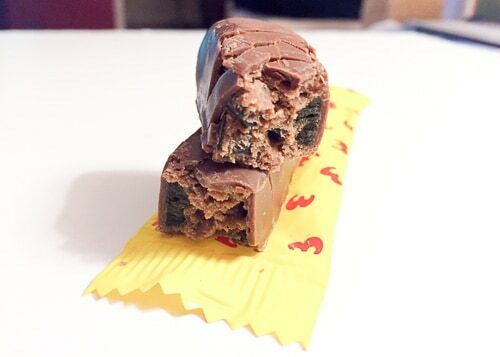 It had a creamy inside and was covered in milk chocolate. The Buff was light but very sweet and tasted kinda like chocolate covered butter cream. 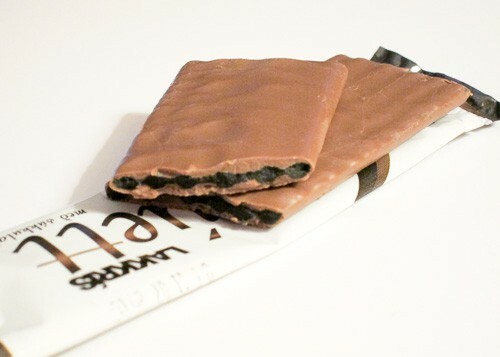 It’s good that this candy bar is on the small side, because any larger and it would be too much to eat in one sitting. I thought the Buff was pretty good. This one was a surprise…I wasn’t expecting the large rope of black licorice (or liquorice!) 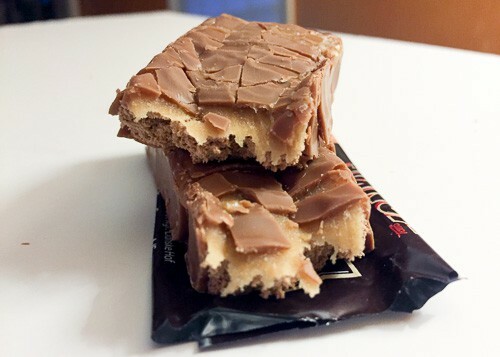 on top of the caramel-y nougat-y filling! Evidently, licorice makes a frequent appearance in Icelandic chocolate bars. And, evidently, Icelanders find this combination of chocolate and licorice absolutely delicious. Maybe I just need to spend more time Iceland? This was one of the more interesting chocolate bars but my least favorite. No licorice in this one! 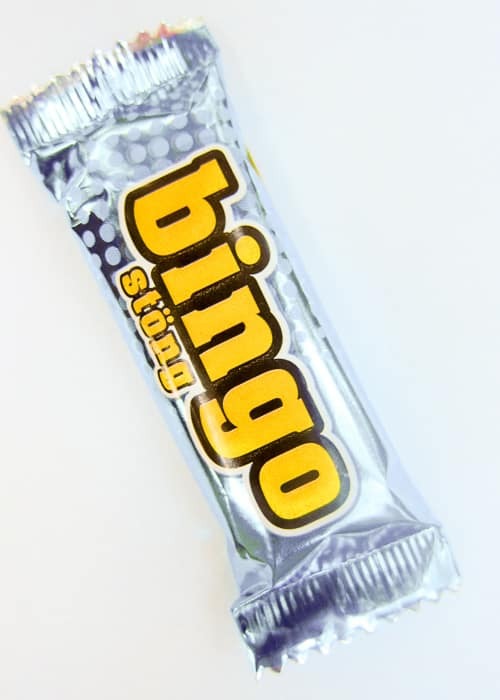 I liked the small size of the Bingo candy bar, and it tasted pretty good, too. 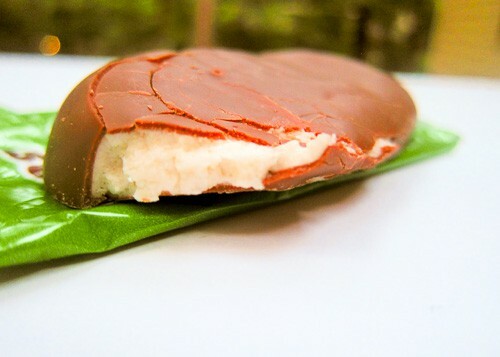 The soft chocolate inside was dense and tasted of faintly of coconut. Overall, the Bingo was very, very sweet. It wasn’t my favorite but it wasn’t my least favorite. I wouldn’t have expected licorice to be in the Pristur Icelandic candy bar but there it is! 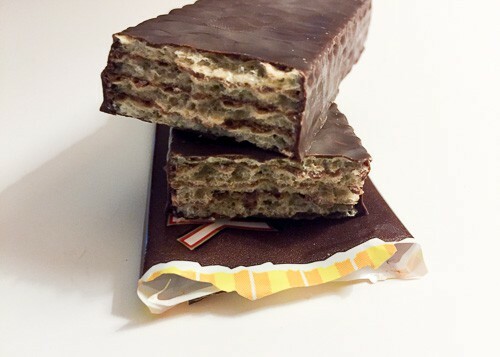 There’s a layer of chocolate nougat but the bar is mostly comprised of 3 strings of black salty licorice (maybe that’s why the number 3 is all over the package?). When Aaron tried the Pristur, he said it tasted like a Hoho with licorice. Although I actually do like salty licorice (I used to buy bags of it when I lived in Hamburg), I’m just not (yet) a fan of chocolate and salty licorice together. 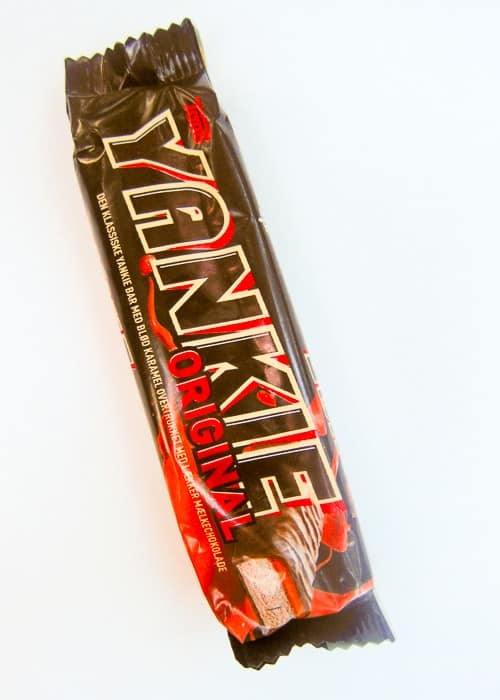 Since I chose my Icelandic chocolate bars based on name alone, I had to buy the Yankie! There was no licorice in this one (whew). I had a feeling this would be like a Milky Way, given the picture on the wrapper. And yep, it was an Icelandic Milky Way. But less sugary sweet than an American Milky Way. I liked that the Yankie had a strong caramel flavor. 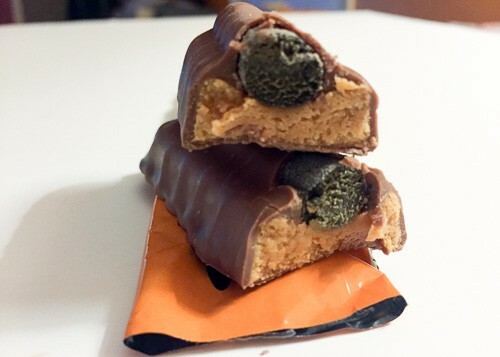 This crunchy candy bar was just what it looks like in the photo below…layers of creamy chocolate and crunchy wafers covered in dark chocolate. 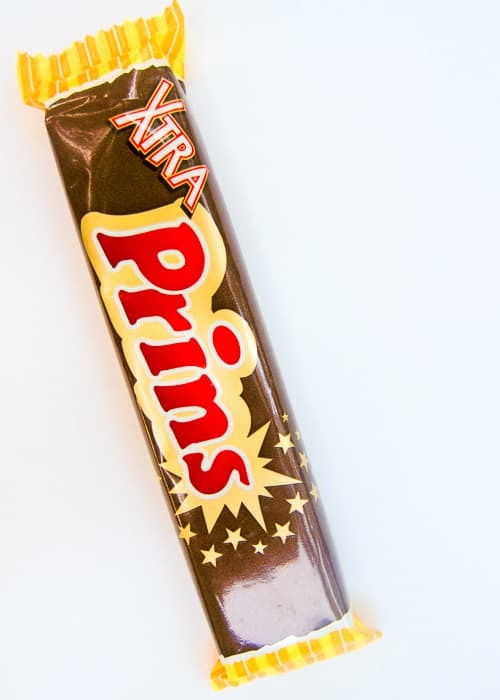 The Prins was very light, not sugary sweet, and you could really taste the dark chocolate. I liked the Prins a lot. 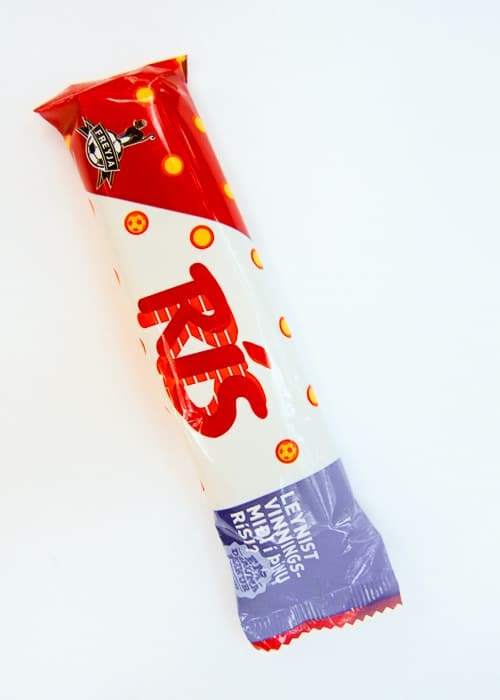 Did you guess that this Ris Icelandic candy bar would have some sort of puffed rice in it? I expected rice crispies but it was more like Kixx cereal covered in milk chocolate. 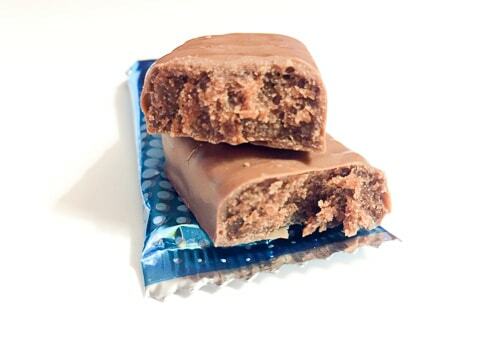 I like crispies in my chocolate bars, so I liked Ris. Licorice and chocolate again! (You’ve probably figured out by now that “lakkris” is Icelandic for licorice.) Needless to say, we weren’t immediate fans of this one. More marshmallow! 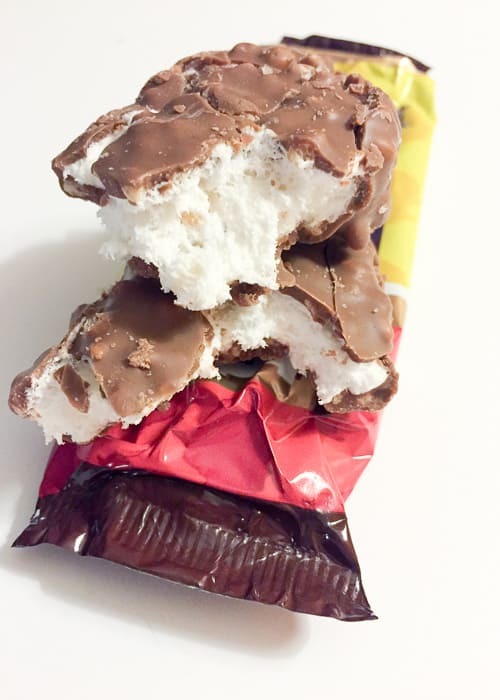 The Buffalo Icelandic candy bar is mostly vanilla flavored marshmallow covered in milk chocolate with a smattering of rice crispies. 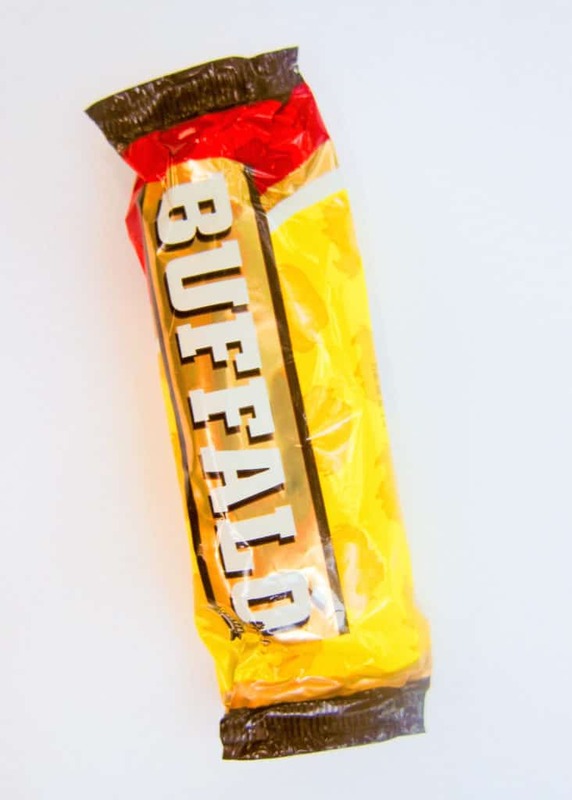 The Buffalo was sweeter than most of the other chocolate bars but not as sweet as the typical US candy bar. I don’t usually go for marshmallow anything but I did like the Buffalo. 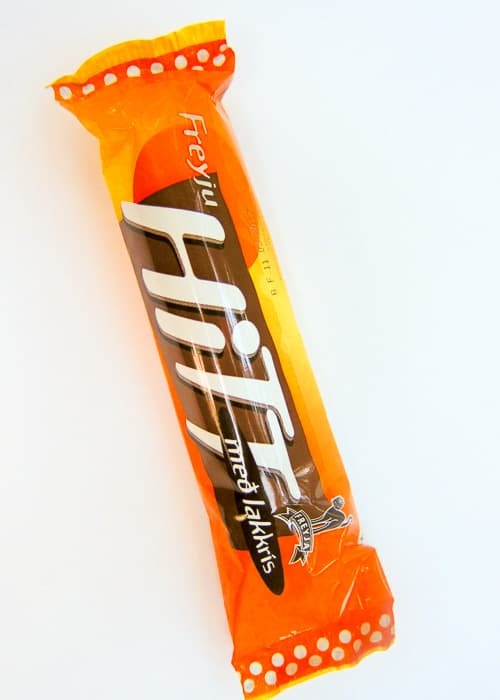 My favorite Icelandic chocolate bar? Probably the Buffalo or the Prins Xtra. The ones with licorice. That said, I’m pretty sure I could develop a taste for chocolate and licorice with enough exposure! I was surprised that there were no nuts in any of the chocolate bars. Maybe I just chose the nut-less ones? Now I’m wondering what all the other Icelandic chocolate bars are like…I should probably go back to Iceland to do more research, right? Want to try Icelandic chocolate? But don’t have a trip to Iceland in your near future? Go to Amazon! Not chocolate, but this Icelandic licorice salt looks interesting, doesn’t it? -- Disclaimer: The International Desserts Blog is a participant in the Amazon Services LLC Associates Program, an affiliate advertising program designed to provide a means for us to earn fees by linking to Amazon.com and affiliated sites. 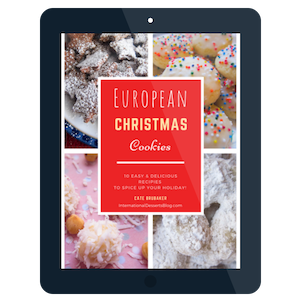 Thank you for supporting my site and helping me make it the best international desserts and travel resource on the internet! Thank you for posting this! 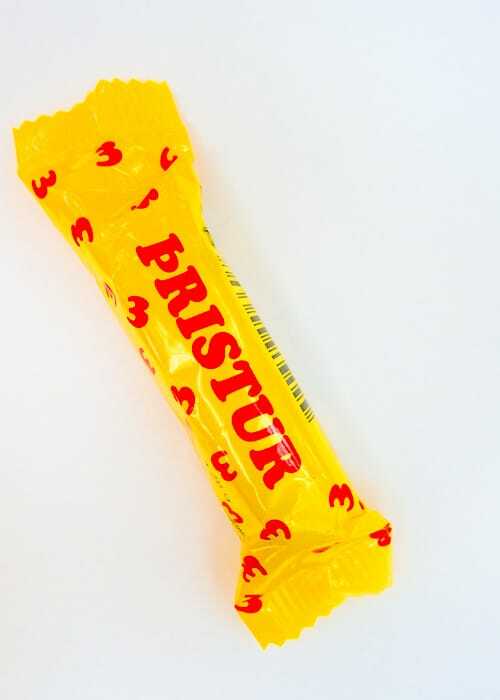 I had a pit stop in Iceland and picked up a bag of Pristur, not knowing what it was. I thought it was absolutely delicious. I hope I can find a way to get it in the US. 🙂 I have never had chocolate and licorice together either but I think it’s divine!